If the vehicle stalls while climbing a hill, never back it down the hill! Use the K-turn to turn around. 1. Stop the vehicle. Keep your weight uphill. 2. Lock the hydraulic parking brake. 3. Leave the transmission in forward gear. Turn the engine off. cle is pointing straight uphill. 5. 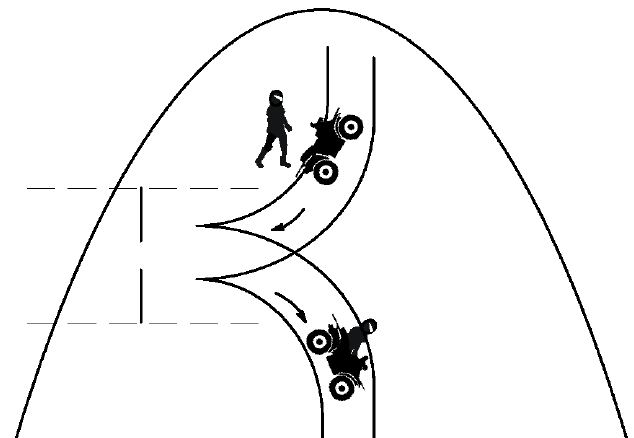 Stay uphill of the vehicle and turn the handlebars full left. 6. Squeeze the brake lever to release the parking brake. to your right until it&apos;s pointing across the hill or slightly downward.